Those of you who know what Nutella is will understand why I’m crazy for it. Those of you who don’t…allow me to enlighten you. 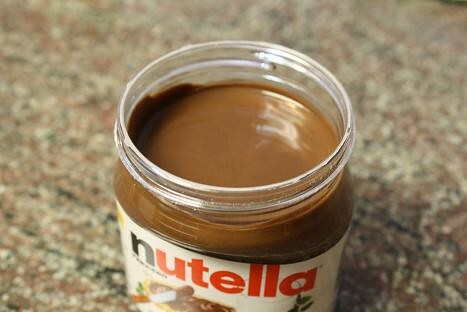 Nutella is a chocolate hazelnut spread that is pure heaven. You can purchase it at most grocery stores and I found it in the aisle with peanut butter and honey. I believe the first time I had Nutella was when I was in Europe, and I remember wondering why I had never been let in on this secret before. First of all, it was included on the continental breakfast table at most places I was staying and I loved the fact that they ate chocolate spread for breakfast! Secondly, it is so deliciously decadent! 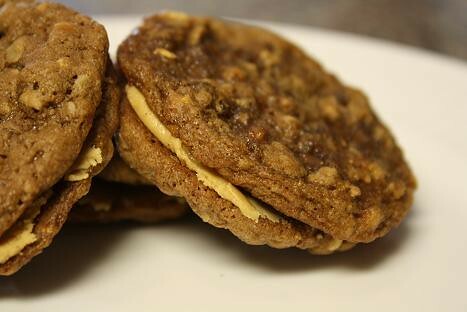 I stumbled upon this great Peanut Butter Oatmeal Nutella Sandwich Cookie recipe on the always reliable Tasty Kitchen site and couldn’t stop thinking about it. Thank goodness for this blog of mine, because it totally justified me making these cookies. I really didn’t need to see much aside from peanut butter and Nutella in the title to be inspired to bake these cookies, because few food combinations make me happier than chocolate and peanut butter. First of all, this was such an easy and fast recipe to make. You just dump all of the ingredients for the cookies in a mixer, and once thoroughly mixed roll 1 teaspoon of the dough into a ball and bake. Once they are cooled you whip up a quick peanut butter frosting that will get sandwiched between two cookies. How good does that sound?! I hope you enjoy these cookies. Click here for the recipe and step by step instructions!